What is celtuce? It is a sort of lettuce, where you eat the stem instead of the leaves. This delicious veggie is not always in stores, but the Asian grocery markets have it a good deal of the time. It has a very unique flavor, but not a strong overpowering one. It is quite crunchy and delicious in a stir fry. 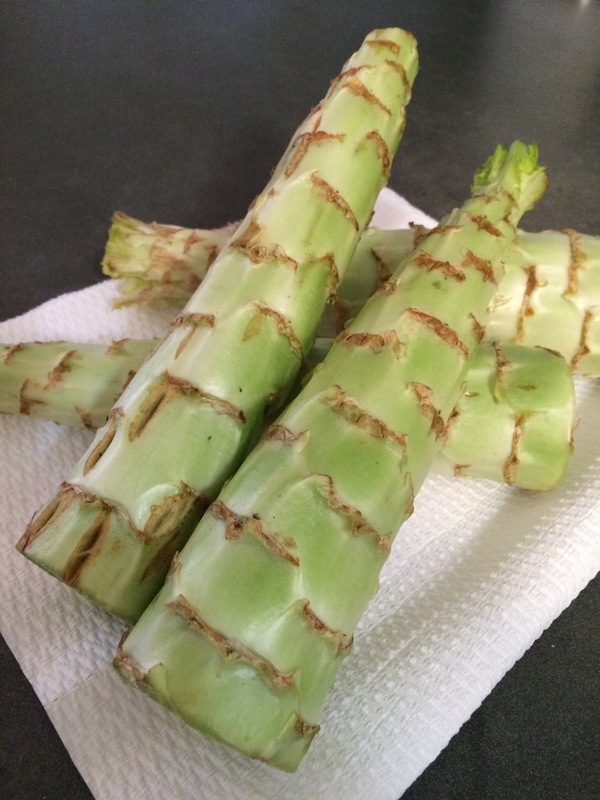 Start by chopping of the ends and peeling the Celtuce. 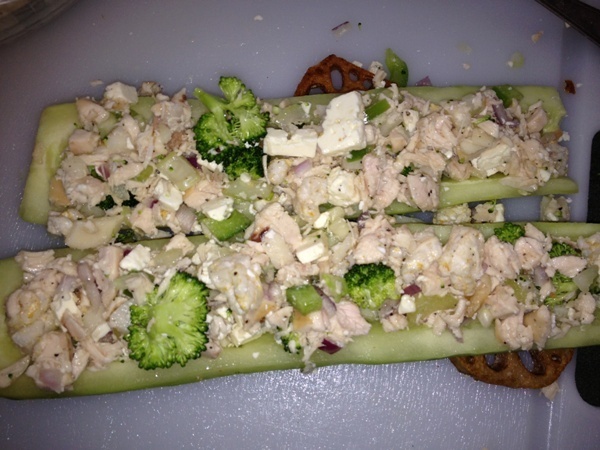 I chopped some in rounds about 1/3 of an inch thich, and then some in longer strips, resembling a celery stick. I also chopped up some green onions and lots of garlic of course, and decided to add some darker leafy greens to this crunchy stir fry, so I grabbed a huge handful of Pea Greens and they went in as well. 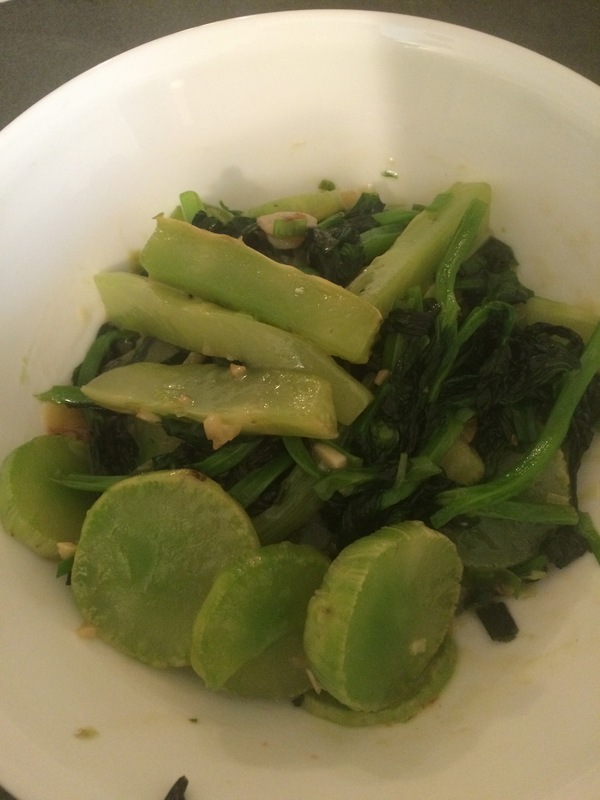 I used around 1 TBSP of sesame oil along with 1 TBSP of grape seed oil, and started stir frying the celtuce, the green onions and garlic, and put the Pea Greens in for last 90 seconds. All done. Enjoy. Very refreshing and tasty! Celtuce is very low in calories, so does not count as a complex carbohydrate (which means it is “free”), but it is very high in the following: calcium, dietary fiber, iron, manganese, magnesium, niacin, potassium, riboflavin, thiamin, Vitamin A, Vitamin B6, Vitamin C and Zinc. 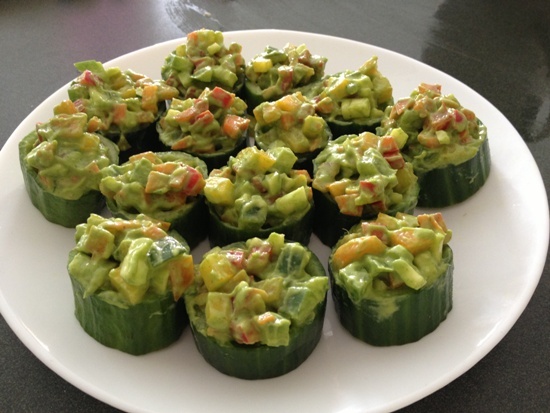 These Cucumber Salad Cups (with avocado-cilantro dressing) are a visually impressive way to serve healthy salad ingredients in a unique and tasty way. Cut an English cucumber (or field cucumber, but peel it) into slightly more than an inch thickness. 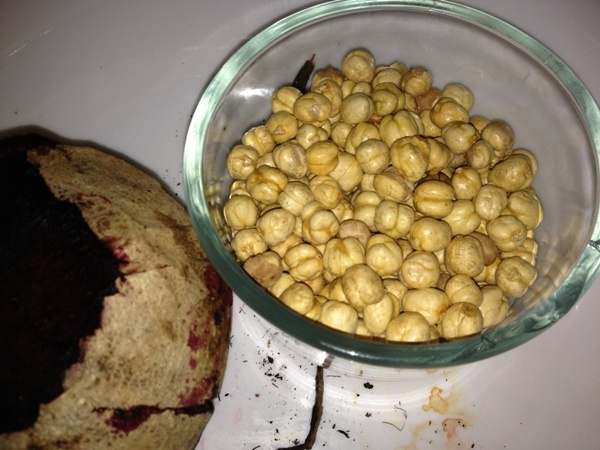 Scoop out the seeds and flesh, but don’t remove all of it. Keep a thin layer at the bottom of the piece, so that you can stuff them without the filling coming out. You can easily do this step several hours ahead, or even the night before. 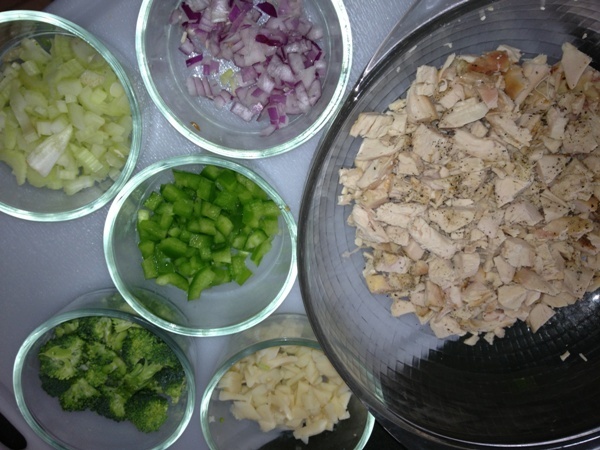 Chop up your choice of vegetables very finely. I used yellow, green, red and orange bell peppers, carrots, zucchinis. 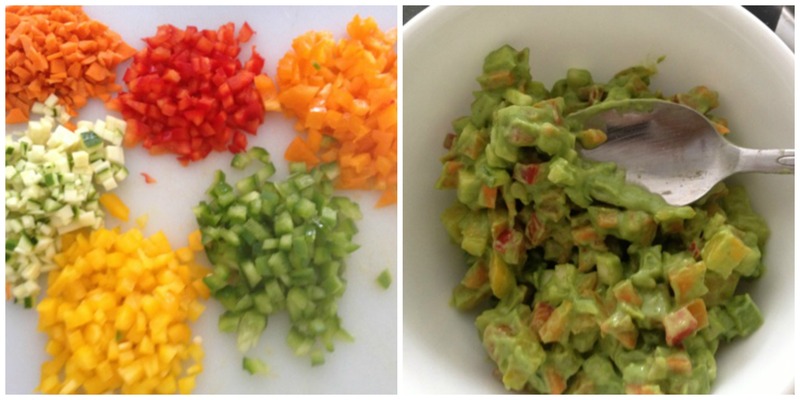 Toss a few tablespoons of avocado dressing onto the veggies to coat them as desired. I also placed a nice dollop of this mixture on a piece of oven-baked cod and it was a positively delicious replacement for a sweet salsa. The crunchy yet creamy texture of the salad with the super-moist delicate fish was nothing short of wonderful. Enjoy. Notice the black sesame corn chips? I definitely scooped up some more with some of those! 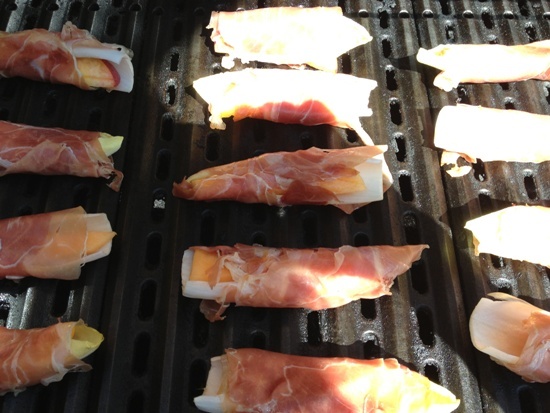 These yummy little fruit and prosciutto endive boats are great as appetizers, are fantastic on the BBQ, but work very well in a super hot oven as well. The fruit softens and their natural sugars caramelize, which when combined with the salty, crispy prosciutto is just a divine combination ….. and a simple endive holds it all together quite beautifully. Cut the thick end of endives so they can peel off individually. 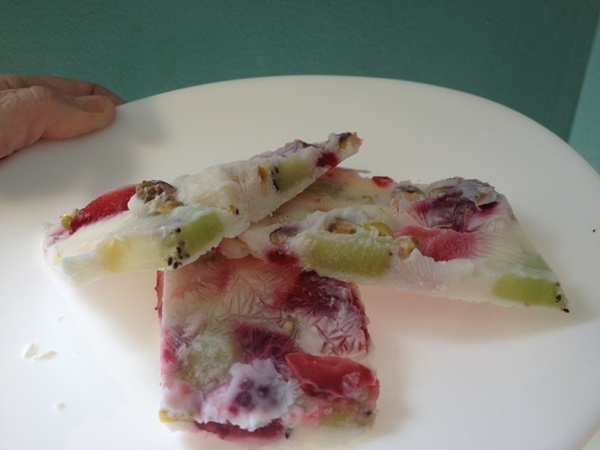 Slice the fruits lengthwise to match the length of the endives. 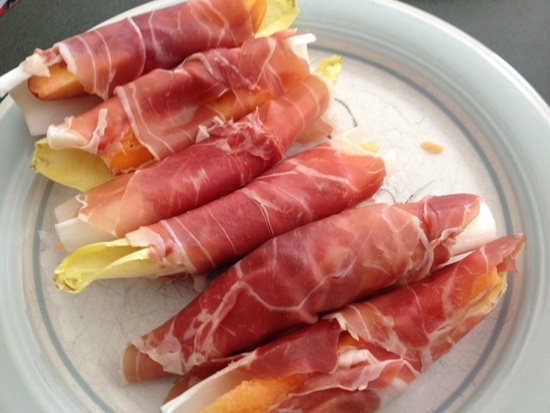 Have your prosciutto slices separated and ready to roll around the endives. Roll one slice of prosciutto tightly around the entire endive, starting from one end and wrap around as far to the other end to cover as much endive as possible. Be firm with your wrapping technique. 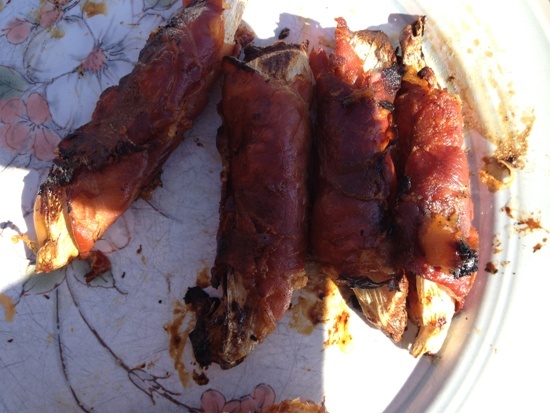 You do not need a toothpick to keep them in place, as the prosciutto is quite sticky, and binds to itself. Get them on the grill. They stay together quite well, but every now and then as the fruit shrinks, it may try to slide off the endive and try to escape. 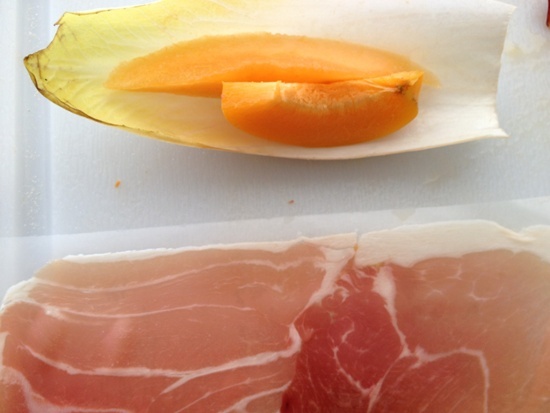 Flip them here and there to get the entire piece of prosciutto as crispy as you would like. Just as with any bacon, some like it super crispy and some not as much. Just make sure the fruit has had time to get really soft and juicy. (alternatively place in an oven on the top shelf at 450 degrees until very crispy). Be careful. The fruit inside is very very hot at first. Let them settle for a bit to let all the flavours fully incorporate. 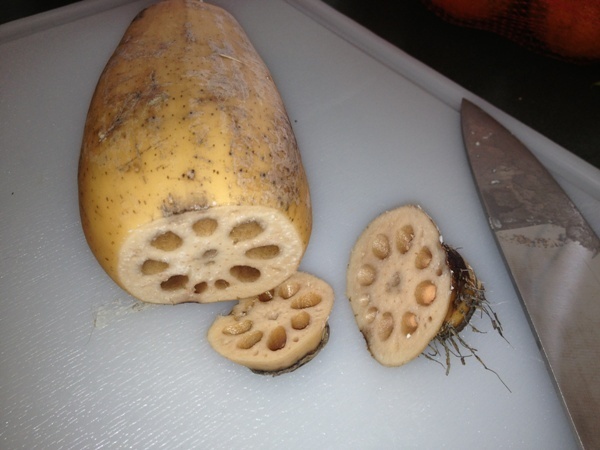 Chop off ends and peel Lotus Roots. Then cut into 1/4 in slices. 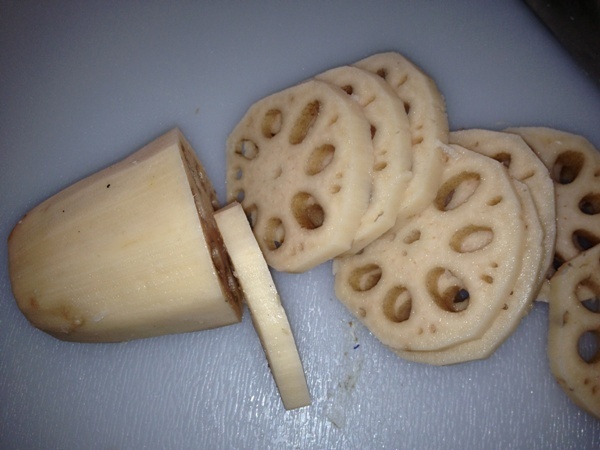 Fry lotus root slices in a little oil until lightly browned (I always use Grape Seed Oil) . Flip them over after about 45 to 60 seconds as they cook quickly. 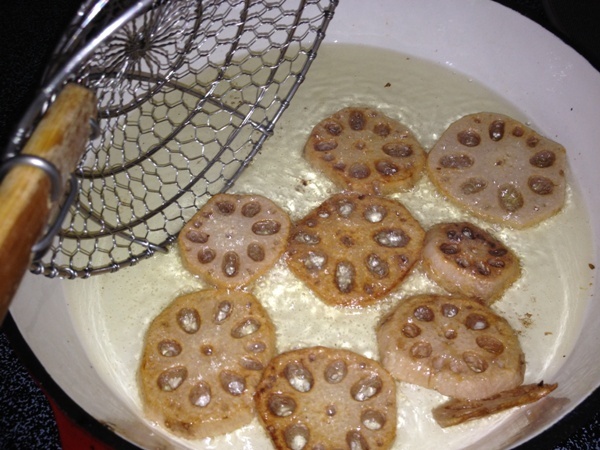 Then set them onto a paper towel to soak up any excess oil. 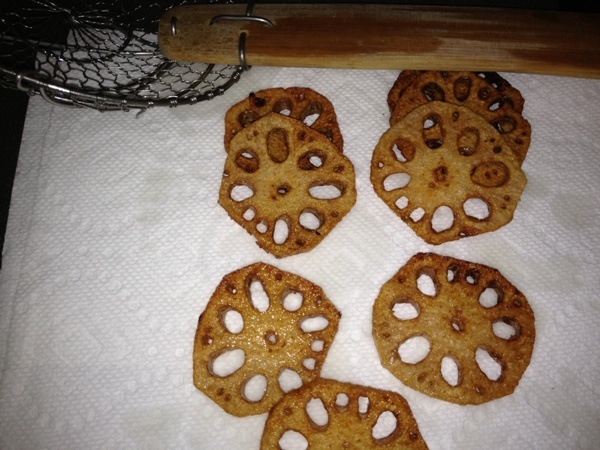 (Note: lotus chips crisp up nicely on the outside but remain moist on the inside, so that very oil penetrates). Lightly salt them if desired. 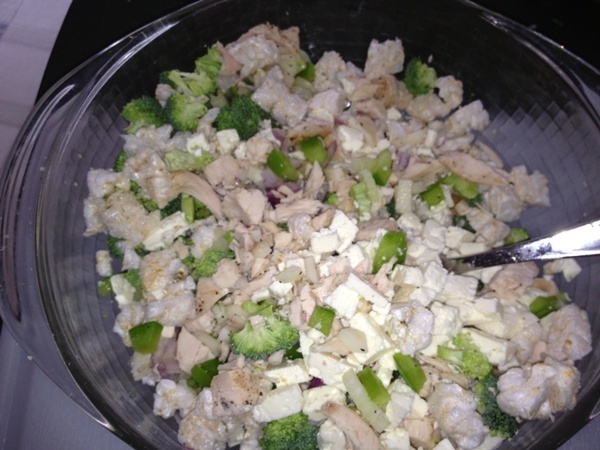 1/4 cup of each, chopped: bamboo shoots, celery, green peppers, broccoli. Toss all together well. 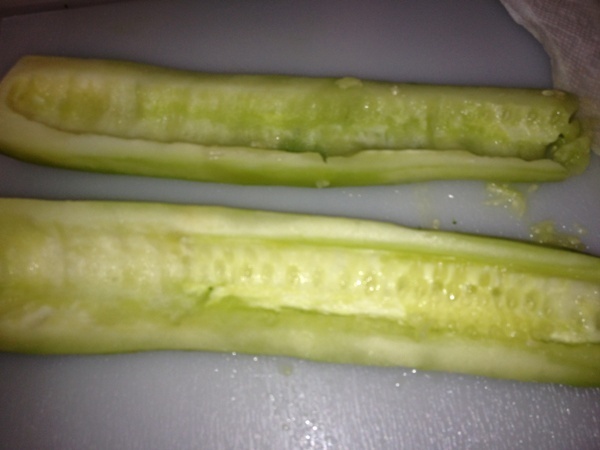 Cut cucumber lengthwise in half, and remove all seeds. Hollow out as many as desired. 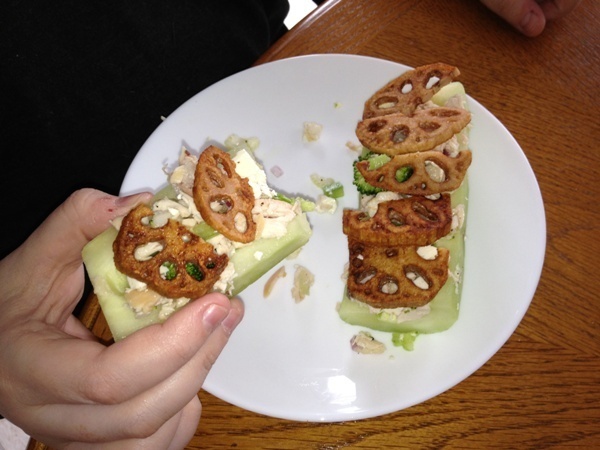 Fill the cucumber boats with chicken mixture. 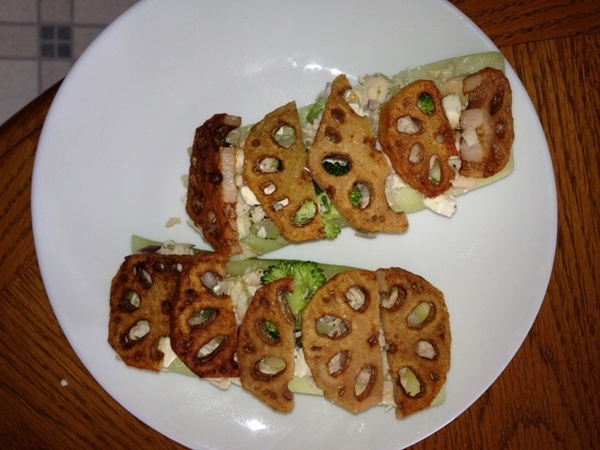 Cut the lotus root chips in half and place along the top of the boat mixture and press down to hold everything together, then eat it like the crunchy delicious healthy breadless chicken salad sandwich that it is 🙂 Oh yaaaaaa!! Imagine you are eating sinfully decadent “bark” whilst you indulge in this super healthy frozen yogurt with fruit and nut combo. Simple as can be. 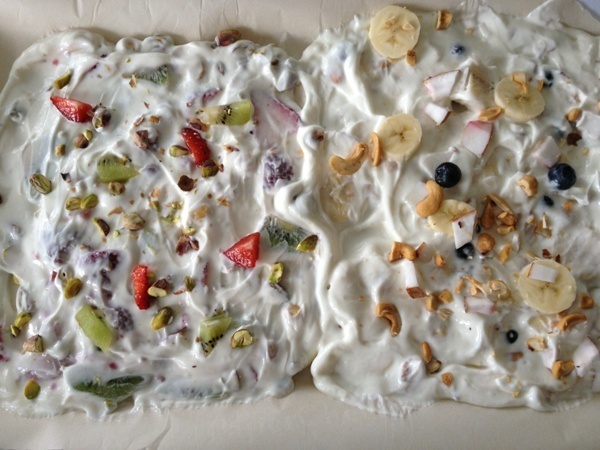 Simply mix whatever yogurt your heart desires in a bowl with chopped fruit and nuts (anything goes) …… Toss carefully though so the delicate fruits don’t bust. 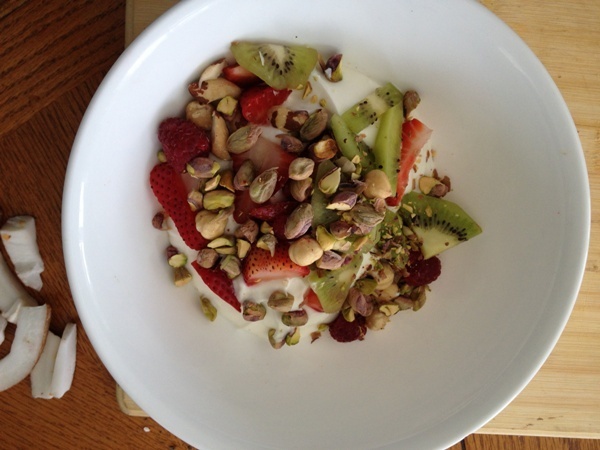 I used Greek vanilla yogurt in one bowl with strawberries, raspberries, kiwis, pistachio nuts and hazelnuts. 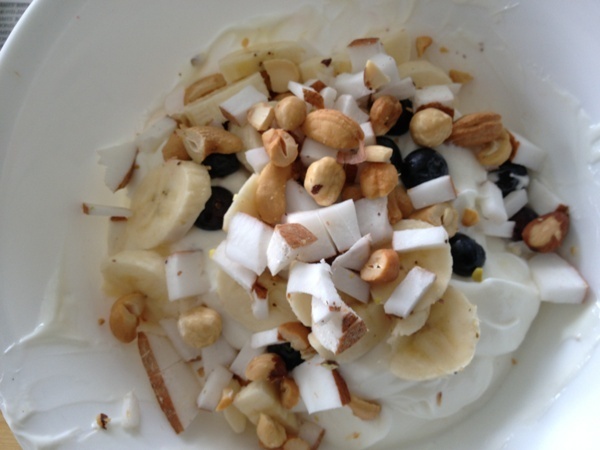 In the other bowl I used the same yogurt with bananas, chopped fresh coconut chunks and salted cashews. 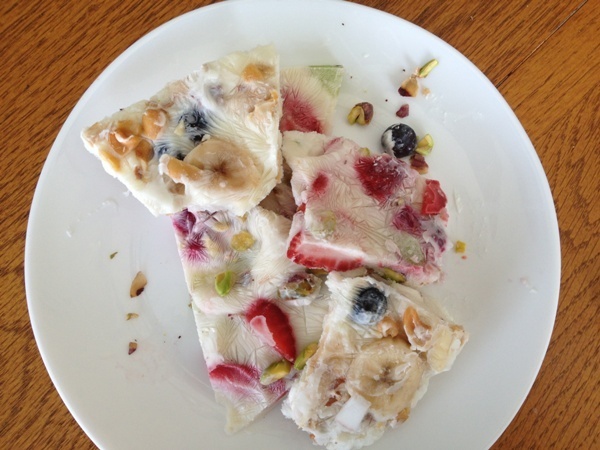 Spread the mixtures out onto a piece of parchment paper placed on a tray or plate (about 1/4 inch thick or so). Freeze overnight. Yes, it does take that long. Then break into pieces of “bark” and indulge. Simply awesome, and very pretty on a nice white plate 🙂 A cool-eating Personal Trainer Recipe. This hummus has a wonderfully light lemony touch but still has the rich depth of a very satisfying, absolutely delicious dip/spread. 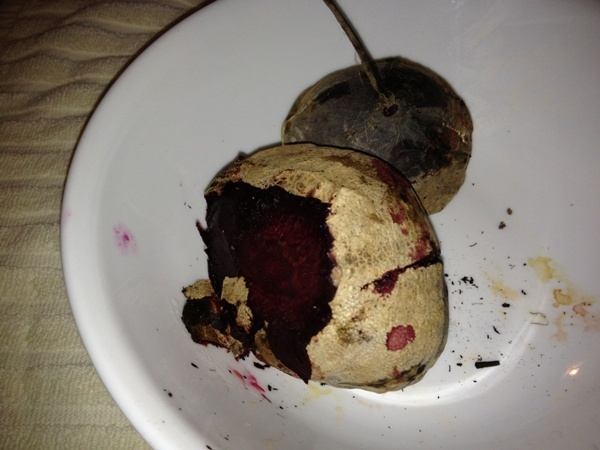 I threw the whole beets (skin on), onto the barbecue on indirect heat for about 45 minutes. The skin then peeled off easily. 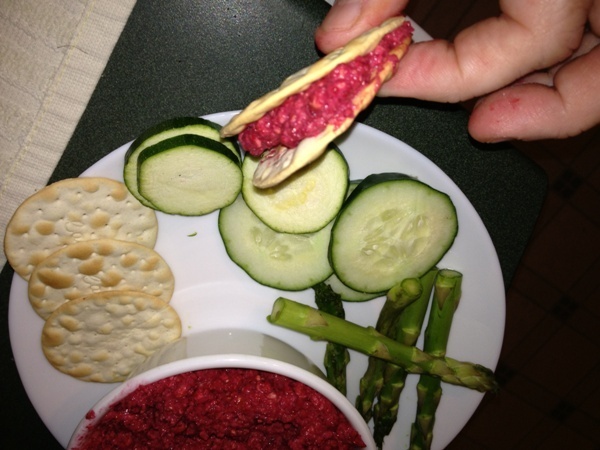 Serve with raw veggies, pita, crackers or as a base for a sandwich. 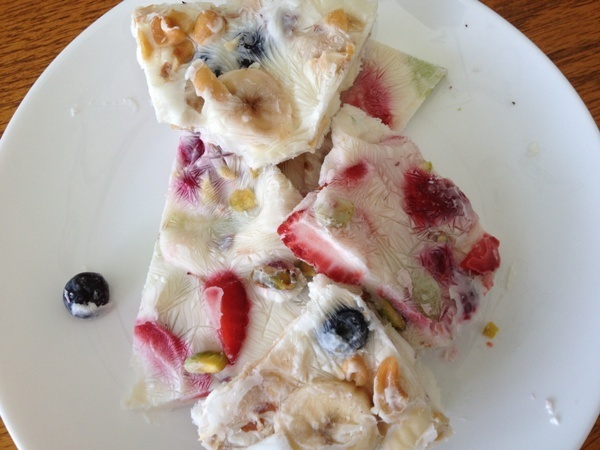 A fabulous Personal Trainer Recipe snack. 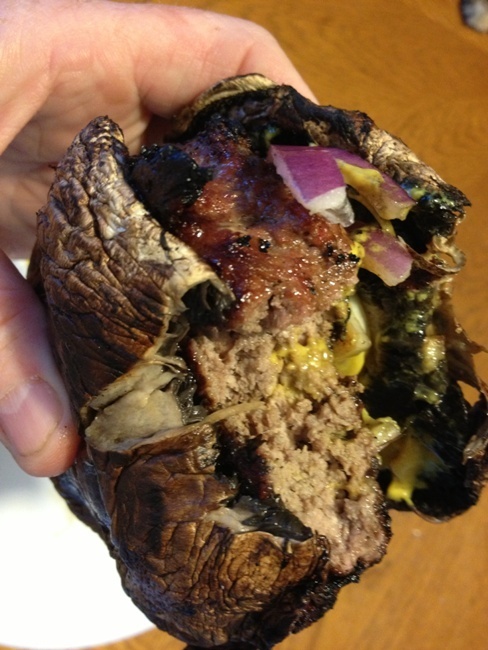 Portobello mushrooms make amazing burger buns!! Sturdy and juicy; they keep beautifully intact (unlike most bread buns). Do not do anything to them in preparation; i.e. don’t brush on any oil, or anything. Simply place them “skin side” down on the barbecue or any grill, and wait until they become juicy and tender on the inside. The skin will remain dry so that they are a breeze to grab onto, but your teeth will still sink into them in a juicy, tantalizing fashion. 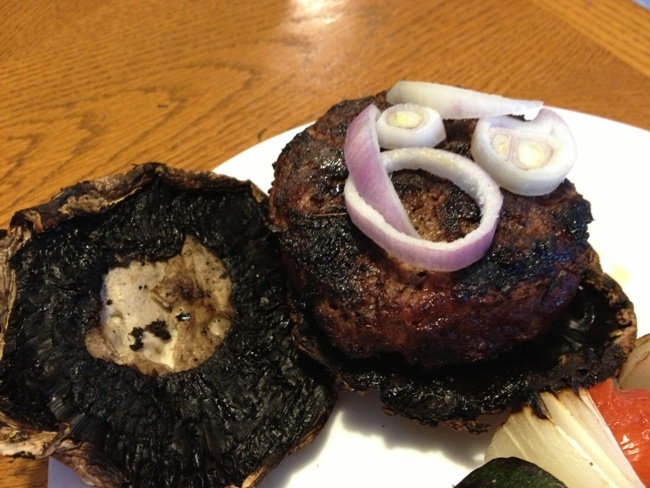 Put your burger in between them, and use all your regular toppings. Yum. A hearty Personal Trainer Recipe. Start by chopping off the large stems and discarding. Drop the whole leaves into boiling water for 60 seconds, then place immediately into cold water. Remove the large veins as pictured, then keep room temp until ready to use. SPREAD A HEAPING SPOONFUL OF PEPPER/GARLIC MIXTURE ON COLLARD LEAF. LOAD ON THE TOPPINGS. HERE ARE THE ONES I USED: Pepper spread, sweet peas, sweet corn, mushrooms, tomatoes, green onions, red kidney beans, black beans, pea sprouts, avocado, cucumbers, baby spinach, pumpkin seeds. ROLL ‘ER UP AND START CRUNCHING! MMMMM, AT THE HALFWAY MARK, AND ALREADY GETTING STUFFED! A simple, delicious personal trainer recipe featuring broiled zuchini. Slice zucchinis in half lengthwise. Chop the herbs coarsely. Brush oil onto each zucchini. Sprinkle with salt, pepper, rosemary and parmesan. Bake at 350 degrees for 15 minutes, then put on “broil” or “toast” for 3 – 5 minutes to brown the tops. Keep a close eye so that the cheese doesn’t burn. For a “Greek” flare, use oregano and crumbled feta instead of rosemary and parmesan. 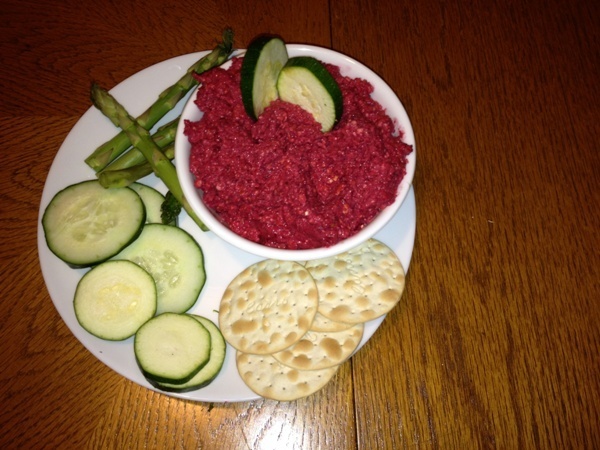 This personal trainer recipe is a deliciously chunky Dip or Spread. 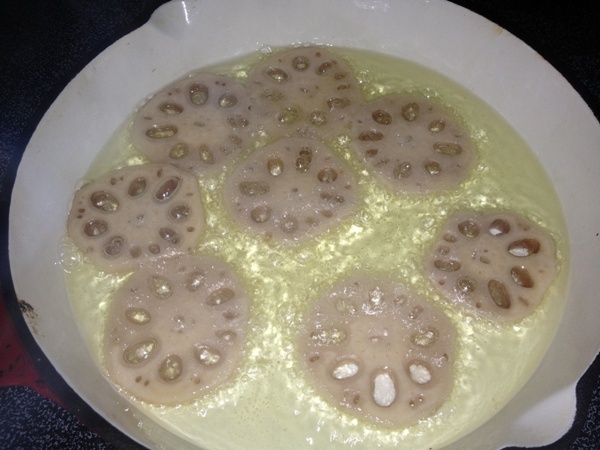 Boil frozen soy beans and peas (soy beans take twice as long). Strain the vegetables. 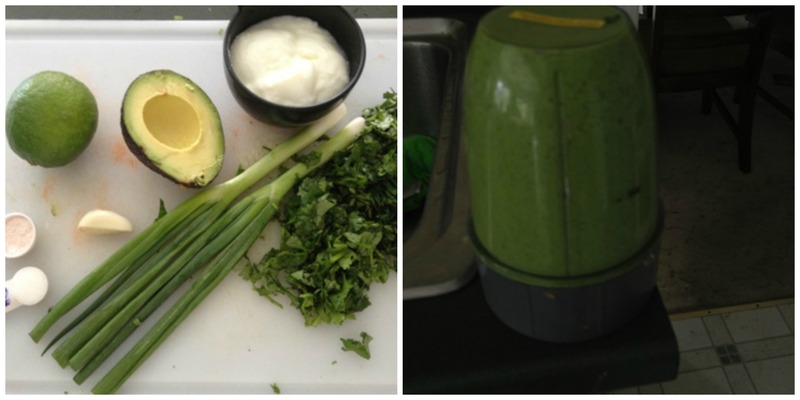 Add to a food processor with all other ingredients. 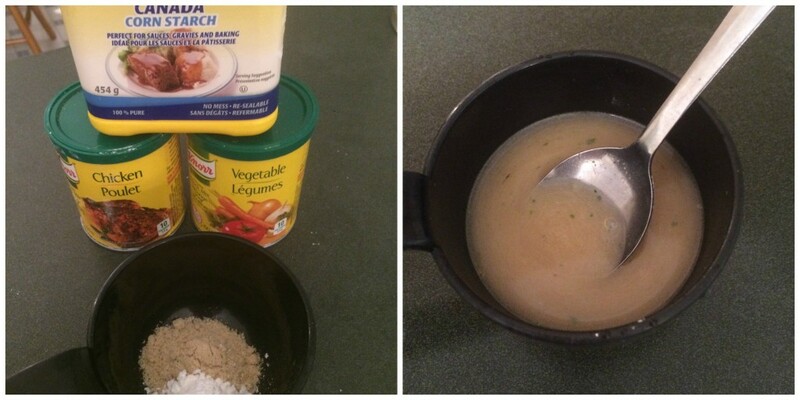 If the mixture is too dry, add more water a teaspoon at a time until it is a thick chunky dip. 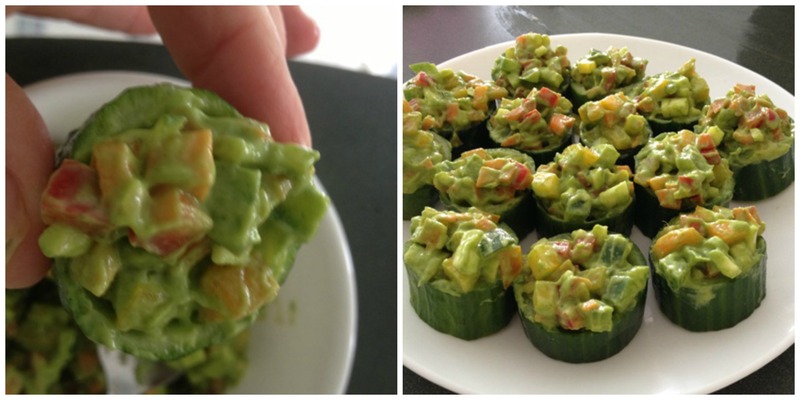 Serve with cut vegetables, pita bread, corn chips, or use as a spread on a crostini or as a base for a sandwich. P.S. I had a nice piece of salmon last night and put a big blob of the hummus on top of it (as well as some “pico””) and it was divine 🙂 Here’s the pic to prove it. 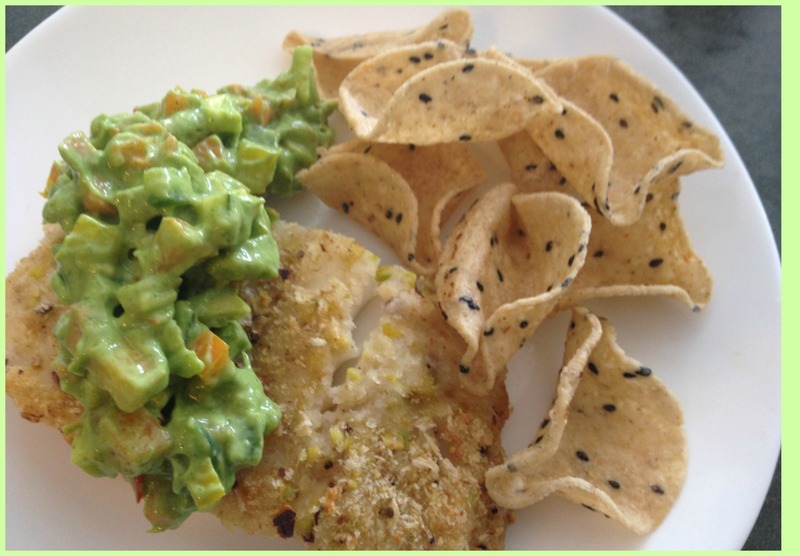 This personal trainer recipe is from Arleigh Winokur, personal trainer Mississauga, from the Personal Training Station. Check out Arleigh’s Yelp Reviews!